Fossil finds, new dinosaur discoveries, news and views from the world of palaeontology and other Earth sciences. Many museums include the fossilised remains of dinosaur eggs amongst their natural history collections and palaeontologists are aware that reptiles were laying eggs on land long before the dinosaurs evolved, but what we know about the evolution of reptile eggs (amniotic eggs in general), is largely based on inference and conjecture. The problem is, for the first 100 million years or so of amniote evolution, there is very little fossil data related to reptile reproduction to study. What we do know, is based on Middle Jurassic to Late Cretaceous fossils. Although, dinosaur eggs are rare, the examples we do have, such as those associated with Asian oviraptorids demonstrate that dinosaur eggs had thick, hardened shells. However, a new study suggests that it was not always like this and that the three main Sub-orders of the Dinosauria probably evolved thick, tough eggs independently. Examples of whole or partial fossilised eggs. Writing in the on-line, open access journal “Scientific Reports”, a team of scientists, including Robert Reisz (University of Toronto Mississauga) and Koen Stein (Royal Belgian Institute of Natural Sciences, Brussels), have examined some of the oldest examples of dinosaur eggs known and revealed new information about the evolution of dinosaur reproduction. The researchers examined the eggs and eggshells of three coeval, but geographically widely distributed Early Jurassic basal Sauropodomorph dinosaurs (Sinemurian faunal stage). These fossils came from Argentina, China and South Africa and include the eggs of Massospondylus and Lufengosaurus. Their analysis showed that the basal Sauropodomorph eggs all had the basic structure, they had a thin calcareous layer less than 100 microns thick. This thin shell layer contrasts strongly with the much thicker calcareous shells associated with Late Jurassic and later dinosaur eggs. At approximately 195 million years old, they are the earliest known eggs in the fossil record, and they were all laid by similar, herbivorous dinosaurs that ranged in size from four to eight metres in length and were the most common and widely spread dinosaurs of their time. These types of plant-eating dinosaur were the forerunners of the giant Sauropods of the Jurassic, dinosaurs such as Brontosaurus, Diplodocus and Brachiosaurus. Massospondylus (basal Sauropodomorpha) nesting site. Massospondylus fossil eggs from South Africa were used in the study. The researchers concluded that these Early Jurassic eggs represented a step in the evolution of dinosaur reproduction, their shells were paper-thin and brittle, proportionately much thinner than the eggs of extant birds. However, thicker, tougher eggshells in the Dinosauria were to evolve across all three Sub-orders later. The much thicker eggshells associated with Sauropods, Ornithischian dinosaurs and the Theropoda must have evolved independently. Other authors of the scientific paper include Edina Prondvai and Jean-Marc Baele. Shell thickness was analysed along with membrane thickness, mineral content and distribution of pores, looking for clues about why these early eggs might have developed hard shells. The scientists concluded that hard-shelled eggs evolved early in dinosaur evolution, with thickening of the calcareous layer (greater than 150 microns), occurring independently in several groups, but a few million years later other reptiles also developed hard-shelled eggs. One possibility is that hard and eventually thicker shells may have evolved to shield dinosaur embryos and other reptiles from predators. Advanced mineralisation of amniote eggshell including those of dinosaurs (≥150 microns in thickness), in general occurred not earlier than the Middle Jurassic and may correspond with a global trend of an increase in atmospheric oxygen. If there were higher levels of atmospheric oxygen, then this would facilitate more efficient gaseous exchange through the porous eggshell and across the egg membranes. More efficient diffusion would permit the evolution of thicker eggshells, which in turn would offer greater resistance to damage and more protection from predators. New research into 195 million-year-old baby dinosaurs and their eggs. The study raises some intriguing questions that may well lead to further research projects. For example, palaeontologists are aware that many types of marine reptile evolved viviparity (live birth), whilst the fossil evidence for the terrestrial Dinosauria seems to indicate that they continued to rely on egg laying. Why didn’t the highly diverse dinosaurs evolve different reproductive strategies over their 160 million years of existence? Everything Dinosaur acknowledges the assistance of a press release from the University of Toronto in the compilation of this article. The scientific paper: “Structure and Evolutionary Implications of the Earliest (Sinemurian, Early Jurassic) Dinosaur Eggs and Eggshells” by Koen Stein, Edina Prondvai, Timothy Huang, Jean-Marc Baele, P. Martin Sander and Robert Reisz published in Scientific Reports. A team of scientists from the Universidad Nacional de Colombia (Colombia), have announced the discovery of a new species of giant brachauchenine pliosaurid from Lower Cretaceous-aged beds in central Colombia. The monster marine reptile, estimated to have measured around ten metres in length has been named Sachicasaurus vitae and is the largest of the three pliosaurid genera discovered to date from Colombian sediments. Ironically, the species epithet for this formidable predator is Latin for “life”, a reference to the huge impact this discovery has had on the village of Sáchica where the fossil was found. It seems that the normally quiet village has had a considerable upsurge in visitors and commercial trade as the excavations of the huge specimen progressed. Sachicasaurus vitae photograph of fossils and skeletal line drawing. The photograph (above), shows a dorsal view of the holotype (MP111209-1). The dotted lines represent parts of the skeleton found separate from the main body fossil deposit. The scale bar located below the photograph of the fossil indicates fifty centimetres. The skull is more than two metres long. The fossils come from Lower Cretaceous deposits located at Sáchica (the genus name honours the village). The specimen was discovered in an articulated state and is estimated to have been around 9.9 metres long, but the researchers have concluded that the fossil remains represent a sub-adult animal so the maximum size for this marine reptile is unknown. Pliosaurs are an extinct clade of short-necked plesiosaurs that were both temporally and geographically widespread. Many pliosaurs were apex predators within Jurassic and Early Cretaceous marine environments. Sachicasaurus vitae photographs and interpretative drawings of the jaws and teeth. Sachicasaurus vitae represents the most complete pliosaurid fossil specimen found to date in Colombia, it is also the largest Pliosaur known from this part of the world. It lived approximately 125 million years ago (Barremian faunal stage of the Early Cretaceous). For such a large animal the front flippers seem particularly small, this suggests that it might have had a different form of propulsion, perhaps being more reliant on the rear flippers and powerful strokes of its tail (assuming the presence of tail fluke). Although the phylogeny of this marine reptile is uncertain, as it possessed a mix of primitive and more advanced anatomical traits, it has been placed within the Brachaucheninae and it may have been closely related to Kronosaurus. An illustration of a typical pliosaurid marine reptile. Photographs and interpretive drawings of the skull in (A) dorsal view and (B) ventral views. The discovery of S. vitae highlights the diversity of pliosaurs known from the Early Cretaceous of Colombia. Two other pliosaurs have been recorded from this part of South America, both of which are smaller than Sachicasaurus. The occurrence of different genera of pliosaurids in the Barremian beds of Colombian suggests that the environmental conditions of the Colombian sea during the Early Cretaceous facilitated the development of sufficient marine life to sustain a diverse group of predators. Stenorhynchosaurus (S. munozi) named in 2016. It had a more elongated snout and may have been a specialised piscivore. Acostasaurus (A. pavachoquensis) named in 2017. It had a robust snout but was approximately half the size of Sachicasaurus. A new type of Australian dinosaur has been described from the fossilised remains of five upper jaw bones (maxillae) found at the Flat Rocks locality in the Wonthaggi Formation in the famous Gippsland Basin of Victoria. Five small-bodied Ornithopods are now known from the state of Victoria. The new plant-eating dinosaur has been named Galleonosaurus dorisae. The jaw bones are of different sizes and this has permitted palaeontologists to plot growth changes in these little dinosaurs as they matured. Writing in the Journal of Palaeontology, the researchers which include Matthew Herne (University of New England, New South Wales) and Alistair Evans (Monash University, Melbourne), used detailed CT-scans of the fossil material to gain fresh insights into the structure and morphology of the cranial anatomy and dentition of small Australian Ornithopods. The research leading to the establishment of this new genus has also helped to define more clearly other small Ornithopods known from the Gippsland Basin and the Otway Basin located on the opposite side of Port Phillip Bay. A life reconstruction of the newly described Australian Ornithopod Galleonosaurus dorisae. When the scientists were examining the maxillae, their shape reminded them of the upturned hull of an old-fashioned sailing ship – a galleon. It was the morphology of the jaw that inspired the genus name “Galleon Lizard”. The species or trivial name honours Doris Seegets-Villiers for her geological, palynological, and taphonomic work on the Flat Rocks fossil vertebrate locality. Fossil jaw bones, a single tooth and a CT-scan image of a jaw bone (Galleonosaurus dorisae). The plethora of vertebrate fossils at the Flat Rocks site, suggests that several more dinosaurs await discovery. However, for the moment, the researchers are confident that Galleonosaurus shared its habitat with at least one other small, light, fast-running Ornithopod – Qantassaurus intrepidus. The jaws of Qantassaurus are more robust and more powerful. The researchers were able to confirm that Q. intrepidus is uniquely characterised by a deep, foreshortened dentary (lower jaw). This suggests that the robust Q. intrepidus and the more gracile jawed G. dorisae fed on different vegetation, they did not compete directly for food, an example of niche partitioning. Extensive research on the Otway Formation material to the west of Port Phillip Bay in conjunction with research on the geology of the Gippsland Basin have permitted scientists to build up a picture of what life was like in this part of Australia during the Early Cretaceous. The dinosaurs lived in an extensive rift valley that had formed as Australia began to separate from Antarctica. Conifer forests dominated and at such high latitudes, the lush environment would have been subjected to long periods of extensive daylight in the summer, but conversely the winters would have been cold with little daylight each day. Although the Earth’s climate was much warmer than today during the Early Cretaceous, it is quite possible that these little dinosaurs would have had to endure winter temperatures close to freezing. Around 125 million years ago, although Gondwana was breaking up, Australia was still linked to Antarctica with a large volcanic mountain range to the east. An illustration of the skull of Galleonosaurus dorisae with fossil elements placed in the correct anatomical position. The lower jaw shown in the image might pertain to G. dorisae based on a reassessment of other known lower jaw elements associated with Q. intrepidus and Atlascopcosaurus loadsi. The scientists conclude that a highly diverse, small-bodied Ornithopod fauna flourished in the periodically disturbed, high-latitude, riverine floodplain environment of the Australian-Antarctic rift valley during the Early Cretaceous (Barremian to Early Albian faunal stage). A phylogenetic analysis places Galleonosaurus as the earliest member of the Elasmaria, a clade of Gondwanan Ornithopods distantly related to the Hypsilophodonts. The Lower Cretaceous rocks either side of Port Phillip Bay were laid down at different times during the Cretaceous. The Gippsland Basin deposits close to the town of Inverloch, were laid down around 125 million years ago, however, the Otway Basin deposits (Eumeralla Formation), represent younger material laid down in the Early Albian (113 million years ago). Leaellynasaura amicagraphica – named in 1989 (Early Albian faunal stage), from the Eumeralla Formation (Otway Basin). Atlascopcosaurus loadsi – also named in 1989 from the Eumeralla Formation. Diluvicursor pickeringi – named in 2018 (Eumeralla Formation). To read an article about the discovery of this dinosaur: Fast-running Ornithopod from Victoria. Qantassaurus intrepidus named in 1999 from the Wonthaggi Formation (Gippsland Basin) – older strata associated with the Barremian faunal stage of the Early Cretaceous. The newly described Galleonosaurus dorisae (2019), also from the Wonthaggi Formation. Researchers at the University of Wisconsin-La Crosse and the Oklahoma State University Centre for Health Sciences have applied mathematical models to assess the manoeuvrability of predatory dinosaurs. This research, published in the on-line journal PeerJ, involving numerous collaborators, suggests that large bodied Tyrannosaurs were more agile and able to turn more sharply than other similar sized Theropods such as Allosaurs and carcharodontosaurids. Tyrannosaur fighting a horned dinosaur. A new study suggests that large bodied Tyrannosaurs may have been surprisingly agile. The research involving complex mathematics, a study of animal anatomy and physics compared how rapidly meat-eating dinosaurs could turn their bodies. In summary, the scientists concluded that Tyrannosaurs could attack smaller, faster and more dangerous prey. It is suggested that the greater manoeuvrability of these carnivores may have been a factor in their evolutionary success. Associate Professor at the University of Wisconsin-La Crosse, Eric Snively, in collaboration with co-author Haley O’Brien (Oklahoma State University Centre for Health Sciences) along with several other leading palaeontologists such as Professor Phil Currie (University of Alberta), demonstrated that whether a Tyrannosaur was dog-sized or a fully-grown, mature adult, it retained its agility and manoeuvrability. Computer models were created to examine the agility of tyrannosaurids. Tyrannosaurs were assessed to be more agile as they had relatively short bodies (anteroposteriorly short thoracic regions, and cervical vertebrae that aligned into posterodorsally retracted necks). In summary, shorter bodies meant less turning resistance and even their tiny arms helped! In addition, long, tall ilia bones (part of the hip), provided plenty of room for huge leg muscle attachments that gave the power needed for rapid turns and pivots. Mapping muscle groups to assess the agility of tyrannosaurids. Tyrannosaur musculature was compared to that of an extant alligator. In terms of the fastest results from the Tyrannosaur family, a horse-sized juvenile T. rex turned the quickest for its size, followed by the giant T. rex “Sue”, the enormous, mature adult from the Field Museum (Chicago). Eric Snively described the T. rex turn as something akin to a “slow-motion-ten-tonne figure skater from hell,” quite apt in a way as T. rex fossils are known from the Hell Creek Formation. The researchers used very accurate anatomical assessments and rigorous statistics to create three-dimensional models that could then be tested for their range of movements. Different Theropods were examined including Dilophosaurus, Ceratosaurus, Giganotosaurus, Sinraptor as well as numerous Tyrannosaurs at different growth stages as well as smaller members of the Tyrannosauroidea Superfamily such as Raptorex. With respect to other Theropods, tyrannosaurids were found to be increasingly agile without compromising their large body mass, such that in a pairwise comparison, tyrannosaurids were achieving the same agility performance as much smaller Theropods. For example, a 500 kg Gorgosaurus had slightly greater agility scores than the 200 kg Eustreptospondylus, and an adult Tarbosaurus nearly twice the agility scores of the lighter Sinraptor. The fossil specimen on display (E. oxoniensis). Enhanced agility and tight manoeuvrability in tyrannosaurids suggest that T. rex et al had superior abilities when it came to pursuing and subduing prey. This new research may have important implications when it comes to examining how large Theropods hunted. If tyrannosaurids were more agile and able to manoeuvre faster than other large predators they may have been more adept than earlier, super-sized, apex predators when it came to catching agile prey. It is postulated that this capability of tyrannosaurids is consistent with coprolite evidence that indicates that tyrannosaurids fed on juvenile Ornithischians. Furthermore, it is proposed that healed Tyrannosaur bite marks on fossilised remains of adult horned dinosaurs and Hadrosaurs indicate an ability to outmanoeuvre quadrupedal prey. The largest non-tyrannosaurids, including Giganotosaurus, often lived in habitats alongside Sauropod dinosaurs. These associations may suggest that allosauroids may have preferred less agile prey than did tyrannosaurids. It is also possible that stability conferred by high rotational inertia, as when holding onto giant prey, was more important for allosauroids than turning quickly. The researchers intend to undertake research to assess the manoeuvrability of ceratopsids and other prey such as duck-billed dinosaurs before applying the same techniques to examine Tyrannosaur bite forces. Researchers including palaeontologists from the Department of Geosciences at Virginia Tech, have identified tiny fossil fragments collected from Upper Triassic deposits in Arizona that provide evidence of the oldest known frogs from North America. Although, no new genus has been erected, the scientists are confident that further study of the microfossils at the location may yield skull and jaw bones which will result in the naming of new species. A Chinle frog encounters a phytosaur. It is likely that phytosaurs would have fed on amphibians. The fossils are composed of several tiny pieces of hip bone, (from the ilium), they were collected last May from three separate locations within the famous Chinle Formation and they have been dated to between 223 and 213 million years ago. The bones represent the earliest equatorial record of the Salientia, the group that includes stem and crown-frogs. These tiny amphibians, little more than two centimetres in length, are not direct ancestors of modern frogs (Anura). One of the authors of the scientific paper, published in the journal Biology Letters, Assistant Professor Michelle Stocker, stated that these fossils underscore the importance of microfossil collection, analysis and study as it helps palaeontologists to build up a more comprehensive picture of an ancient ecosystem. Time-calibrated stratigraphic and biogeographic distribution of Triassic and Jurassic Period anuran specimens. The image above shows (a) the stratigraphic sequence indicating the three fossil examples of Chinle frogs and their relationship to the Early Jurassic Prosalirus (MNA 291) from the Kayenta Formation (Arizona), whilst (b) shows the biogeographic distribution of fossil anurans from the Jurassic and Triassic. Note, the proximity of the Late Triassic Chinle frogs to the equator. Photograph (c) shows an eyelash sized fossil ilium whilst (d) and (e) are computerised scans of the same fossil material shown in lateral and medial views. Scale bars equal 1 millimetre. The fossil material gathered from extensive sieving and screen washing of sediments in order to obtain microvertebrate fossils, consists of long, hollow hip bones with the hip socket offset rather than centred, anatomical traits that are characteristic of frogs and that help to support their hoping style of locomotion. Stocker and her collaborators include fellow scientists from Virginia Tech, Arizona’s Petrified Forest National Park, and the University of Florida’s Museum of Natural History. The Chinle frogs share more features with living frogs and Prosalirus, a genus of Early Jurassic frog found in sediments from the present-day Navajo Nation (Arizona), than to Triadobatrachus, an Early Triassic frog discovered in Madagascar. Comparing the ilia of stem anurans and those of extant frogs (Ascaphus, Leiopelma, Alytes and Barbourula) scale bar = 1 mm. This is the first time that frog fossils have been found in sediments associated with phytosaurs and early members of the Dinosauria. The research team hope that further work screening and washing sediments from the Chinle Formation sites, will yield more information about the tiny animals that lived alongside some of the first dinosaurs in North America. Everything Dinosaur acknowledges the assistance of a press release from the Virginia Tech College of Science in the compilation of this article. The scientific paper: “The Earliest Equatorial Record of Frogs from the Late Triassic of Arizona” by Michelle R. Stocker, Sterling J. Nesbitt, Ben T. Kligman, Daniel J. Paluh, Adam D. Marsh, David C. Blackburn and William G. Parker published in Biology Letters. This week has seen the formal unveiling of the fossilised remains of a pliosaur at North Lincolnshire Museum in Scunthorpe. The fossils, consisting of a single tooth, a series of vertebrae, elements from the ribs, the tip of the snout and a single humerus, suggest an animal of around eight metres in length. It would have been one of the apex predators of the Late Jurassic marine environment. Rose Nicholson (North Lincolnshire Museum), palaeontologist Richard Forrest and Darren Withers (Stamford and District Geological Society), showing where the fossil bones are located on a pliosaur skeleton. The first evidence of the remains of a marine reptile, were discovered by Darren Withers of the Stamford and District Geological Society during a field trip to a north Lincolnshire quarry in October 2017. The Society had visited the quarry previously and were aware that the Kimmeridge Clay deposits (dating from 157 to 152 million years ago), contained numerous fossils, but marine reptile bones, especially several pieces from an individual skeleton are exceptionally rare. CEMEX, the quarry owners, granted further access to the site and over the next twelve months or so more of the pliosaur remains were found. In total, the haul consists of twenty-eight vertebrae, a single tooth, fourteen rib elements, a bone from the upper arm (humerus) and some fragments from the front portion of the upper jaw (premaxilla). It has been estimated that the specimen is around 155 million-years-old. Extracting fossils at the north Lincolnshire quarry (CEMEX). Pliosaurs were marine reptiles, part of the Plesiosauria Order, specifically, the short-necked plesiosaurs, the Suborder Pliosauroidea. They were the apex predators in most Late Jurassic marine ecosystems. Pliosaurs had an enormously powerful bite, perhaps the most powerful bite of any vertebrate, a complex system of sensory organs in their snouts, superb eyesight and the ability to taste water as they swam to help them locate prey. The customised CollectA Deluxe Pliosaurus model. The model helps to portray what the “Scunthorpe Pliosaur” might have looked like. The fossils will be on display at the North Lincolnshire Museum in a temporary exhibit, however, there are plans to give this exceptionally rare fossil find from eastern England a permanent home at the Museum. Richard Forrest laying out one of the vertebrae in the correct anatomical position. Richard Forrest holding a pliosaur tooth. Everything Dinosaur acknowledges the assistance of a press release from North Lincolnshire Council in the compilation of this article. Ever since Charles Doolittle Walcott, discovered the now famous Burgess Shale deposits of Cambrian-aged fossils in British Columbia, palaeontologists have marvelled at the amazing snapshot of ancient marine life the fossils represent. One of the enduring mysteries surrounding many of the preserved remains is how to classify the more than 500-million-year-old-fossil specimens. One such Burgess Shale creature, a prehistoric worm with jaws – Amiskwia sagittiformis and its equally ancient cousin A. sinica from the roughly contemporaneous Maotianshan shales of Yunnan Province, China have finally found a home on the Tree of Life. The fossil, Amiskwia sagittiformis from the Burgess Shale (508 million years old), preserving bilateral jaw elements inside its head. Researchers from Bristol University in collaboration with a former colleague now based at the University of Yale, have identified that this soft-bodied creature is a stem lineage to arrow worms that possesses the jaw apparatus seen in microscopic gnathiferan worms. This new analysis of ancient fossils helps to link recent DNA studies on the bristle-jawed arrow worms (Chaetognatha), indicating that these worms are related to the Gnathifera, tiny, unsegmented worms with primitive jaws that like the chaetognaths, are found in marine environments. The scientists conclude that the soft-bodied taxon Amiskwia possesses characters intermediate between chaetognaths and gnathiferans. The head of the arrow worm, Parasagitta elegans. This group of animals (Chaetognatha), are the closest living relatives to the Amiskwia genus. Like many of the Burgess Shale animals, an original description of Amiskwia was published by Walcott (1911). Walcott made the connection with extant arrow worms (chaetognaths). These unsegmented worms are predators and they use the spines on their head for catching prey. Despite the remarkable degree of preservation of Burgess Shale specimens, fossils of Amiskwia are very rare when compared to other Burgess Shale Middle Cambrian biota. Fossils of Amiskwia sinica are also very rare in the Chinese Maotianshan shales. These types of creatures may have comprised a scarce component of the Middle Cambrian marine fauna, or perhaps, there is a fossil preservation bias. With few fossils to study, there was widespread debate amongst scientists with regards to Walcott’s conclusions regarding the taxonomy of Amiskwia. The renowned American palaeontologist, Stephen Jay Gould (1941-2002), re-ignited the controversy by speculating that these little, soft-bodied, squished fossils represented an organism that had no modern relatives. Gould proposed that Amiskwia was an experiment in evolution that ultimately failed leaving an extinct lineage and no modern-day descendants. The problem with Walcott’s idea that Amiskwia was related to arrow worms was that scientists were unable to find evidence of any grasping spines at the anterior end of the animal in any of the fossils. Instead, many researchers proposed that Amiskwia was a representative of another group of worms the ribbon worms (Nemertea). When Dr Jakob Vinther from the University of Bristol’s Schools of Earth Sciences and Biological Sciences and Luke Parry (Yale University), studied specimens of Amiskwia, kept at the Smithsonian Institute, they found something that had been overlooked by the previous researchers. Interpreting these structures as a set of jaws, their resemblance led the scientists to the conclusion that there was a link between these fossils and the Gnathifera. In essence, the Amiskwia fossil material represents a sort of half-way stage between two important groups of invertebrates. Amiskwia had the jaw apparatus of a gnathiferan, but the body plan of an arrow worm. The gnathostomulid Rastrognathia macrostoma, these microscopic animals have a jaw apparatus similar to Amiskwia, which scientists now propose are amongst the closest living relatives of living arrow worms. This study in conjunction with the recent DNA analysis, confirms that Amiskwia is the fossil link between the Gnathifera and arrow worms, the Chaetognatha. This research was originally conducted some years, ago but was not published as the paper’s conclusions lacked supporting evidence from other studies. Now the authors have published their findings in the journal Current Biology. The study follows a new phylogenetic study, which finds robust support for arrow worms forming an evolutionary group with gnathiferans. Inferred phylogeny. Thumbnails at the bottom of the figure show reconstructions of relevant extant and extinct gnathiferan and chaetognath taxa. Scientists have pieced together a little bit of the enigmatic Burgess Shale and the Chinese Maotianshan biotas and linked them to modern organisms. Amiskwia has been found a place on the Tree of Life. It is a stem lineage to arrow worms that possess the jaw apparatus seen in gnathiferan worms. This jaw evolved into the fearsome grasping spines in living arrow worms, which play an important role in marine ecosystems. The scientific paper: “Bilateral Jaw Elements in Amiskwia sagittiformis Bridge the Morphological Gap between Gnathiferans and Chaetognaths” by Jakob Vinther and Luke A. Parry published in Current Biology. Everything Dinosaur acknowledges the help of a press release from the University of Bristol in the compilation of this article. Researchers have discovered a new species of ancient marsupial that lived deep in the Arctic Circle approximately 69 million years ago (lower Maastrichtian faunal stage). The new mammal has been named Unnuakomys hutchisoni, not much bigger than a house mouse (Mus musculus), it is likely that this little creature was nocturnal and may have retreated to burrows to protect itself from periods of extreme cold. Known from more than sixty fossil specimens, the vast majority being tiny teeth but two dentaries (lower jaw bones ) were found along with a fragment of upper jaw (maxilla), this little mammal helps to flesh out the rich, diverse and unique Late Cretaceous biota of Alaska. Hadrosaurs (Ugrunaaluk kuukpikensis) under the northern lights in the Late Cretaceous of Alaska – inset shows tiny mammal. See note at the bottom of this article. For several years now, researchers have been exploring the Upper Cretaceous strata that is exposed along the steep banks of the Colville River. The researchers, which include lead author of the paper on Unnuakomys hutchisoni, Jaelyn Eberle (University of Colorado) and her collaborator Patrick Druckenmiller (University of Fairbanks Alaska), have uncovered evidence of a unique assemblage of dinosaurs and the discovery of this little marsupial represents the most northern of this type of mammal known to science. The climate during the Late Cretaceous in this part of the world was not as severe as it is today, but the animals living this far north would have had to endure around four months of complete darkness each year and the temperatures would frequently drop below freezing. The fossil material representing U. hutchisoni was collected during the sieving of sediments from the Pediomys Point Locality of the Prince Creek Formation exposed along the Colville River on the North Slope of Alaska. Field team members pose for a photograph next to buckets of sediment that they will sift through to search for tiny mammalian teeth. This part of Alaska was some 80 degrees north around 69 million years ago. It was once thought that these high latitudes were virtually devoid of life, but that view has gradually changed as more fossil discoveries have been made. Teeth of U. hutchisoni greatly outnumber those recovered from other mammals at Pediomys Point, this could be down to sampling, or it could have arisen due to a preservation bias, perhaps the remains of this tiny mammal were more likely to be preserved than other mammal bones and teeth, although this is unlikely. The abundance of Unnuakomys fossils in relation to other mammals could indicate that this tiny animal thrived in an environment well above the Arctic Circle whose climatic extremes may have acted as a biogeographical barrier preventing the encroachment of other types of Late Cretaceous mammal. Looking for fossils on a steep riverbank. In a reflection of the likely ecology of this miniature marsupial, that of an animal well-adapted to living in the dark, Eberle and her colleagues gave the new mammal the genus name Unnuakomys, a mixture of Greek and the indigenous Iñupiaq language that means “night mouse.” The trivial name honours the palaeontologist J. Howard Hutchison, who was the first person to identify and explore this fossil assemblage. The research team, whose project was funded with a National Science Foundation grant, identified the new marsupial using a painstaking process. With the help of numerous graduate and undergraduate students, they collected, washed and screened ancient river sediment collected on the North Slope and then carefully inspected it under a microscope. Over many years, they were able to locate numerous fossilised teeth, most of which were no bigger than a grain of sand. By far the most durable part of most mammal skeletons are the teeth, thanks to their coating of hard enamel. It is the shape of the teeth and their wear pattern, particularly the shape of the molars that allow palaeontologists to identify the type of mammal they have found simply by examining the teeth. Mammalian teeth have unique cusps on the crown that differ from species to species and they, as a result, are highly diagnostic. The triangular cusps on the teeth of U. hutchisoni are reminiscent of the triangular blades associated with pinking shears and are typical of an insectivore. Unnuakomys hutchisoni lower jaw bone with teeth. Other co-authors of the Journal of Systematic Palaeontology paper include William Clemens (University of California), Paul McCarthy (University of Alaska Fairbanks) and Anthony Fiorillo of the Perot Museum of Nature and Science. 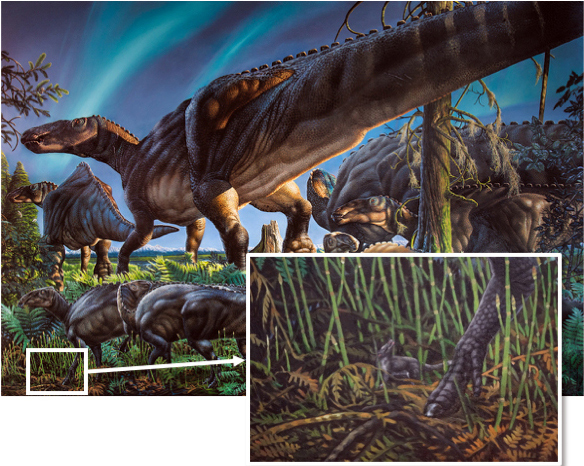 In 2015, Everything Dinosaur reported upon the discovery of a unique species of Alaskan Hadrosaur (Ugrunaaluk kuukpikensis), James Havens produced an exquisite piece of art showing a herd of these duck-billed dinosaurs moving through the Late Cretaceous, Alaskan landscape. To illustrate the likely position of U. hutchisoni in this ecosystem, the original artwork was carefully photoshopped to permit the inclusion of the little mammal (see inset above). As our understanding of the fauna and flora of Late Cretaceous Alaska evolves, the artwork may have to be altered again, in the meantime, we have an excuse to show the original illustration once more. The original Ugrunaaluk illustration without the inclusion of a little marsupial. Everything Dinosaur acknowledges the assistance of a press release from the University of Alaska Fairbanks in the compilation of this article. A small, but speedy dinosaur is the newest member of the Superfamily Tyrannosauroidea, a distant relative of the most famous dinosaur of all Tyrannosaurus rex. T. rex et al might have a reputation for being giant, bone-crunching apex predators, but for much of their evolutionary history, the Tyrannosaurs have been rather over-shadowed by other super-sized dinosaur carnivores. Indeed, it was only in the last few million years of the Cretaceous that these types of Theropod emerged as the apex predators of northern latitudes. The new dinosaur, named Moros intrepidus, at approximately 78 kilograms (data range 53 to 85 kilograms), around the same bodyweight as a South American Jaguar (Panthera onca), is about ninety times lighter than its famous top-of-the-food-chain relative. Ironically, contrary to public opinion, M. intrepidus might just be more typical of the Tyrannosauroidea bauplan than its more famous relatives – Gorgosaurus, Albertosaurus and T. rex. Moros intrepidus from the Late Cretaceous of central Utah. The fossilised remains of a partial right leg consisting of a femur, a tibia, metatarsal bones and some toe bones from the fourth toe were discovered in sediments representing the lower Mussentuchit Member of the Cedar Mountain Formation located in Emery County (Utah). These fossils, in conjunction with isolated teeth from the front portion of the upper jaw (premaxilla) found nearby provide the basis for this new taxon. The deposits represent a terrestrial environment, a large delta and they date from approximately 96 million years ago (Cenomanian faunal stage of the Late Cretaceous). Moros intrepidus represents the oldest known Cretaceous-aged tyrannosauroid discovered to date in North America. It extends the definitive fossil record for these types of dinosaurs by around 15 million years. Phylogenetic and temporal relationships between tyrannosauroids and an examination of faunal turnover. The Allosaurs/Megaraptor apex predator niche was gradually taken over by Tyrannosaurs. In the diagram (above), the section on the left (a), shows the fossil record gap between Late Jurassic tyrannosauroids and much larger Late Cretaceous members of the Tyrannosauridae family such as Lythronax (L. argestes). Section (b) demonstrates the temporal range of these Theropods and the change in bauplan, whilst (c) demonstrates key evolutionary anatomical changes. The blue and pink coloured shapes in (d) reflect the transition from Allosaur/Megaraptoran dominated ecosystems to Tyrannosaur dominated palaeoenvironments. Palaeontologists know that the Tyrannosaur lineage dates back a long way. For example, basal tyrannosaurids such as Stokesosaurus (S. clevelandi) are known from Upper Jurassic deposits of Utah. By the Late Cretaceous (Campanian faunal stage), Tyrannosaurs were large and had become the iconic apex predators beloved by dinosaur fans and film directors. The fossil record for North American Tyrannosaurs was essentially blank, giving palaeontologists a T. rex skull-sized headache when it came to piecing together how these Theropods changed over time. The discovery of Moros helps to narrow a 70-million-year-gap in the fossil record of tyrant lizards in North America. Silhouette of M. intrepidus showing known fossil elements. Key = (g) femur, (h) tibia, (i) fourth metatarsal, (j) second metatarsal, and (k) pedal phalanges of the fourth digit. Scale bar (c) 1 m, (g–k) 5 mm. Note the tooth (views d-f) are not to scale. In 2013, two of the authors of the Moros intrepidus paper, Lindsay Zanno and Peter Makovicky (Field Museum, Chicago), published a study on a large allosauroid from similar-aged sediments. The dinosaur, named Siats meekerorum is estimated to have measured around 12 metres in length, dwarfing the contemporary Moros, which had a hip height of around 1.2 metres. The researchers conclude that within a palaeoenvironment dominated by giant, allosauroid Theropods, Tyrannosaurs such as M. intrepidus relied on their speed and small size and would have kept out of the way of the larger predators. Siats meekerorum has nothing to fear from these two Tyrannosaurs. Moros intrepidus may have scavenged the kills of larger Theropods but these types of tyrannosauroid were very much the secondary predators. A study of the longer limb bones indicates that the individual was around six to seven years of age when it died. It was likely to have reached its adult size. A phylogenetic assessment indicates an affinity with Asian Tyrannosaur taxa, in essence, the ancestors of famous North American dinosaurs such as Gorgosaurus and Tyrannosaurus rex migrated into North America from Asia. Right tibia (a–f) and right fourth metatarsal (g–l) of M. intrepidus (NCSM 33392). The etymology of this new tyrannosauroid reflects the later faunal turnover that led to the apex predator roles in North America being dominated by Tyrannosaurs. The genus name is from the Greek “Moros”, the embodiment of impending doom, for the descendants of this fast-running dinosaur were to evolve into some of the largest and most formidable terrestrial predators known to science. The species name is from the Latin “intrepidus”, a reference to these intrepid dinosaurs making the migration from Asia into North America and their subsequent dispersal. Although around ninety times lighter than Tyrannosaurus rex, Lindsay warns against underestimating the predatory abilities of Moros. The scientific paper: “Diminutive fleet-footed tyrannosauroid narrows the 70-million-year gap in the North American fossil record” by Lindsay E. Zanno, Ryan T. Tucker, Aurore Canoville, Haviv M. Avrahami, Terry A. Gates and Peter J. Makovicky published in Nature Communications Biology.